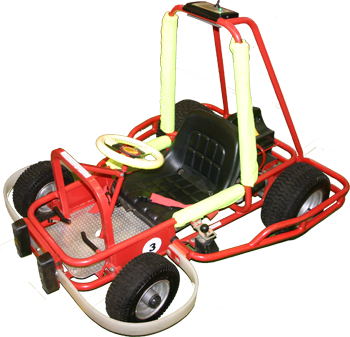 Go-Karts are a perfect idea for any children's party or event, indoor or outdoor, giving the children a fun and safe experience they will always remember. 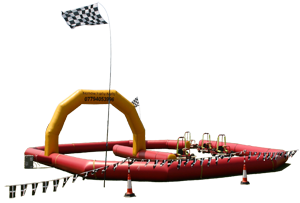 We provide a mini inflatable grand prix circuit and brightly coloured go-karts, suitable for girls and boys between the ages of 4 and 9. Please note a height restriction of 4'9" is also applied, this is for safety reasons. We can travel to indoor and outdoor locations throughout Cornwall, providing there is room for the track and sufficient access for the Karts. However we do strongly recommend that the go kart parties are held indoors as the go karts cannot operate in the rain. Contact us for details of a venue near you. The track is 11m x 15m but you will also need enough room for children to play/observe from outside the track area. Parties are tailormade to suit individual requirements, venues and location. Inflatable track - covers an area of 11 x 15 metres. Trophy and personalised certificate for birthday child. Preparation, setting up and disassembly of track. There will always be a minimum of 2 fully trained persons at your event to offer help and encouragement to the children. (Please note the price quoted above is for the central Cornwall area where we are located. Price does not include venue hire or food). Kernow Party Karts are delighted to present the latest addition to our collection of go-kart tracks. 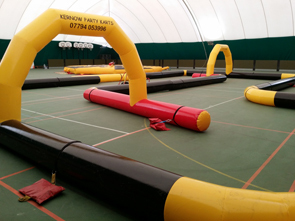 The new kart track measures 18 x 13.5 metres and is suitable for fetes, fun days and parties (due to the size of the new track, there are only a limited number of indoor venues available). More photos available in the Gallery! Kernow Party Karts are available for a variety of fund raising events and school fetes with NO BOOKING FEE. A proportion of the day's takings are donated to your event, to be agreed prior to the event. HALF DAY and FULL DAY hire is available. Safety Assured: Public Liability Insurance. Our experienced family team will be supervising at all times to ensure the children have a great time and are kept safe. Safety is paramount with Kernow Party Karts. The electric powered karts can be pre-set to reach a maximum speed of between 1 and 6 miles per hour. Battery powered Karts - no fumes, no noise, for indoor and outdoor use - grass or tarmac, without damaging grass or hall/gymnasium floors.